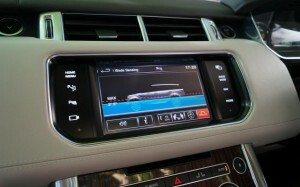 In designing the new Range Rover Sport, Land Rover went to their existing buyers and asked them what they wanted. Their answer was simple; give us more Range Rover and give us more Sport. Getting the basics right wouldn’t have taken long, thanks to the recent launch of the grown-up all-aluminium Range Rover but, and apologies for jumping to the conclusion so early, what the team in Warwickshire have achieved with that base is absolutely phenomenal. Parked side-by-side with the new Sport, the original model looks like a brick. Where the old model was squared off, upright and blunt, the new model is full of subtle curves, tight contours and sloping roof lines. 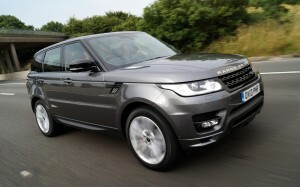 There is a more sophisticated style to it, with a very definite nod towards the wedge shaped Evoque. The new Sport is marginally bigger than the outgoing model, but you would never know. Despite that, Land Rover has managed to knock as much as 420 kg off the weight of the car. Slimming down the Sport by that amount has brought massive improvements to performance, efficiency and handling. At launch you can choose from just two engines. Attracting the most attention will be the thunderous 5.0 litre supercharged petrol V8 engine that produces 503 bhp, giving the Sport truly Porsche Cayenne beating performance levels. The zero to sixty sprint can be despatched in five seconds dead, while a maximum speed of 155 mph is possible. Most sales however will go to the glorious TDV6 diesel model that produces 282 bhp along with 600 Nm (443 lb ft) of torque. Performance remains stunning, with 0-60 taking just 6.8 seconds and a maximum speed of 138 mph, while economy is impressive at a claimed 37.7 mpg. Currently CO2 emissions drop as low as 199 g/km, but there is a lower power diesel engine coming soon that will drop that slightly, while a diesel hybrid will be revealed at the Frankfurt Motor Show with emissions of 169 g/km. That will give the Sport a BIK rate as low as 25%, significantly lower than its rivals. From inside the car you are isolated from what’s happening up front, with even the V8 seemingly producing noise only from the exhaust tips, such is the level of soundproofing. 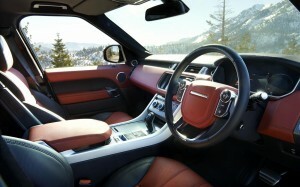 You sit lower in the Sport than you do in the standard Range Rover, gripped by seriously bolstered sports seats. It’s a seriously sophisticated place to be, with leather covering every surface and a large touch panel in the centre console to operate nearly every feature. There is no shortage of toys to play with either, with even the low end models coming loaded with kit from external cameras and adaptive cruise control to climate control and satellite navigation. You can also feel the difference in space, with the new car offering more than ample room for five passengers, or even seven with the addition of a secret hidden pair of rear seats. Such is the level of luxury that even these temporary seats come with their own climate control settings. On the road, the new Sport is simply staggering. It has a firmer set up than its big brother, as you would expect, but the automatic damper control still removes you from most of the imperfections of the road. It is quick to settle after a rogue pothole or surface crack, while body roll is kept impressively in check. Turn in to a corner too quickly and a slew of computers step in and start to challenge the laws of physics. There is an updated Terrain Response system, Dynamic Response active lean control, Dynamic Active Rear Locking Differential, Torque Vectoring and more, flattering even the most ham-fisted of drivers. The systems don’t interfere unduly though, or at least not in a way you would notice under normal driving. You are left with what is effectively a Range Rover GTi, and one that gathers speed rather more quickly than you might notice. 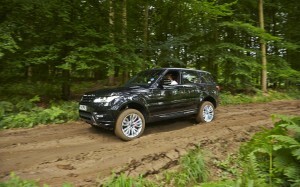 A Range Rover is nothing without off-road ability though. Fortunately, the Sport delivers there too, with a Land Rover engineer telling me that it is more capable than even the utilitarian Defender. I had the chance to take the Sport off-road and, while I admit to being no expert once I’m off the tarmac, the Sport carried on long after I’d have given up. The Sport can wade through 850 mm of water, with a neat display showing you how deep the water you’re in is, while heading down 45 degree slopes covered in wet mud proved no issue at all. A 100 mph blast down a gravel rally stage was more to my style, something the car didn’t have any problem with, although slowing down two tonnes of metal for a hairpin bend does take slightly longer than you might expect. A 150 mph run down a runway proved the car is as quick as claimed, too. What impresses most about the range of capabilities is that every test was done in the same vehicle on the same tyres. Bar a check for cuts in the rubber, nothing was done to the vehicle between stages. There’s no need to change to off-road tyres or prepare the car in any way. You simply point it at where you want to go. What Land Rover have come up with here is a car that is bigger, more comfortable and better equipped than my first apartment, a car that will outperform the majority of sports cars on the road, and a car that will happily cross rivers and climb mountains. As I said in the opening, it’s absolutely phenomenal.